At our practice, we aim to help patients feel their best when they’re with us and when they’re at home. To help your body express its greatest health, we’re proud to offer a variety of products that may be beneficial to you. We’re happy to answer any questions you may have about them at your next visit. Take a look at the products you can find in our practice below. Suffering from arthritis or have sore muscles and joints? Biofreeze Professional combined with your chiropractic care can help provide safe and effective pain relief. It is a topical product that is fast acting, paraben-free and uses soothing menthol to provide long-lasting pain relief. 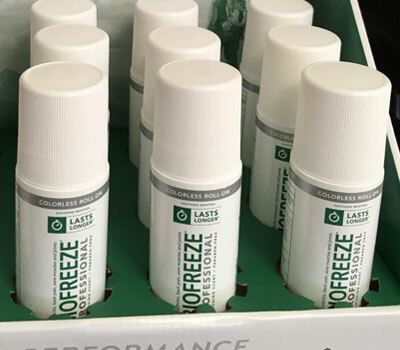 Biofreeze Professional lasts up to 36% longer and is easier to apply, due to optimized, smoother formula, than the standard version sold in retail stores. It is available in gel, roll-on or spray. Difficulty sleeping? Waking up with a stiff neck? 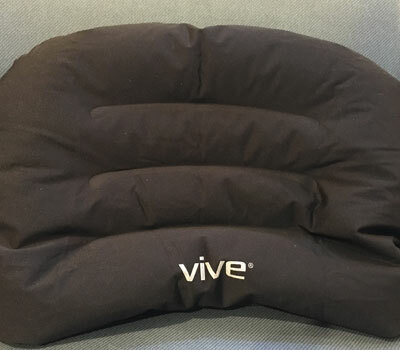 Check out our cervical pillow which offers support for your neck and spine. 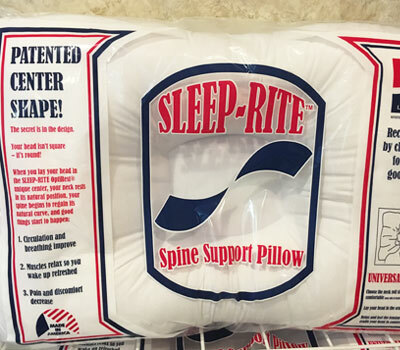 The Sleep-Rite pillow has an indented center that allows your neck to rest in a natural position allowing your spine to regain its natural curve. It helps to improve circulation and breathing, relaxes muscles so you wake refreshed and decreases pain and discomfort. Ask us if a cervical pillow is right for you at your next visit. Hot and cold therapy can be effective for muscle and joint pain between adjustments. 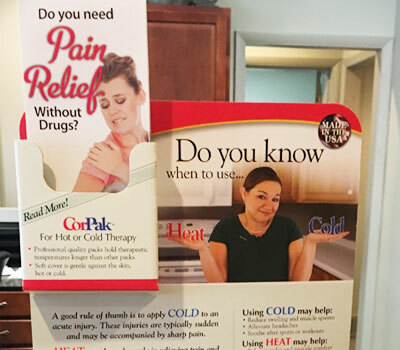 Cold therapy is best used for new or acute pain while heat is best used for chronic or recurring pain. Our CoreProducts hot and cold packs can be used hot or cold. We carry the 6″ x 10″ size in our office but can order additional sizes for your needs. Experiencing foot, heel or toe pain pain? 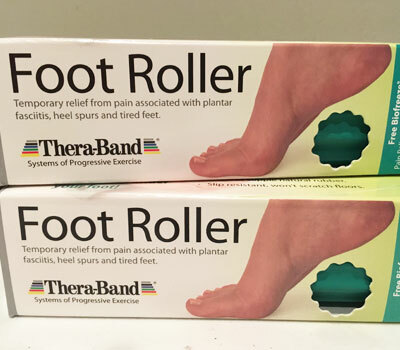 Check out our foot roller! The ridged design delivers a great foot, heel and toe massage. It can be used at room temperature or it can be chilled or frozen for even greater relief. It is made with a hollow core to help match any foot and it is slip resistant and will not scratch your floors. Need more support in your home or office chair? Do you get low back pain while driving your car? Check out our lumbar support cushion which can be used at home, in your office or in your car to provide that extra support you need while sitting. This is an ideal product for those who work long hours in the office or the perfect addition to your home study. We are dedicated to help you find relief from pain – contact us today to find out how we can help!